While there is a lot of theories speculating his identity, no one really knows who Banksy is. But the England-based artist’s anonymity coupled with his distinctive take on street art has drawn a lot of attention on both media, and art enthusiasts. To this day, Banksy secrecy continues to intrigue many. And while it may have been his means to get away from all vandal crimes he has committed, albeit he is mostly allowed to, Banksy is no doubt one of many successful modern artists that have made fortune out of his unconventional artworks. To be fair, it is no-nonsense works. Banksy’s free-spirited craft often target political and societal issues. Themes include anti-war, anti-consumerism, anti-fascism, anti-imperialism, anti-authoritarianism, anarchism, nihilism, and existentialism. His creations further challenge the boundaries between art and differing views that seals everyone inside the box of diminishment. The artist’s approach to urban art is a provocative speech concerning the world of inward thinking and forlorn human conditions. And as the auctioneer smash the gavel against the sound block, the artwork slowly slid halfway down the frame. It wouldn’t be a big deal if it wasn’t supplemented by the unmistakable sound of a shredder. Fortunately, perhaps as what Banksy has planned, the picture didn’t completely pass through the razor-sharp tool. Two Sotheby officials rush to remove the picture from the wall, leaving a room full of art enthusiasts in awe. At this point, no one is aware of the prank pulled off by the artist himself. 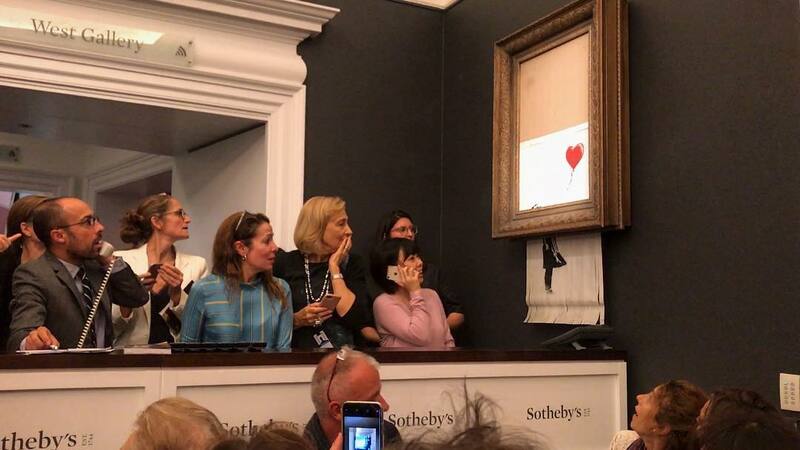 “It appears we just got Banksy-ed,” Alex Branczik, Sotheby’s director of contemporary art in Europe, said. Initial concern regarding the destroyed artwork soon dissipated, as art expert suggest that it is now worth even more. “A few years ago, I secretly put a shredder into a painting,” Banksy told in the video. “In case it was ever put up for auction…” This has then proceeded with a clip showing the installation of a shredder into a thick frame, and later the video of the whole stunt. Looks like the artist had been concealing his identity in the crowd. The successful bidder of “Girl With Balloon” is a private collector, and bidding at Sotheby’s staff member on the phone. The auction house and the bidder is currently discussing the next steps. Dear Android OEMs, is a "notch" really that necessary? Here's why Nokia X7 (7.1 Plus) should be your next smartphone!